I’m just crazy about digitalis species. This rare foxglove is one of my favorites. 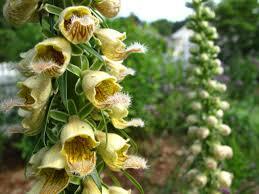 Digitalis ‘Gelber Herold’ blooms in midsummer with towering spikes of soft, tan-yellow flowers with rusty veining. The flowers are larger and more yellow than the Dig.f.gig. species. Categories: A-D, Featured Plants, New Plants for 2019, Plants A-Z, Plants by Season, Plants In Situ, Spring, Summer, The Cottage Garden, The Paddock, The Secret Garden, The Yellow Garden. Digitalis used to be called “Folks Glove,” because its flower resembled the finger of gloves worn by “good folk” or fairies, who, like the plant, dwell in deep hollows and woody dells. This stately plant grows easily in any fertile soil, seeds itself freely, and lends a naturalized look at the edge of woodlands, especially when combined with Aruncus, Actaea, or ferns. Digitalis ferruginea ‘Gelber Herold’ (Yellow Herald) has immaculate evergreen glossy rosettes of long, narrow dark green leaves which are a feature all year. The flowers spikes are tall, stiff and densely crowded with charming ochre, yellow-lipped flowers arranged all around the stem in perfect regularity. More yellow in the flowers than the species.